Choosing healthier sources of fat can lower your risk for heart disease, and sunflower oil may help. 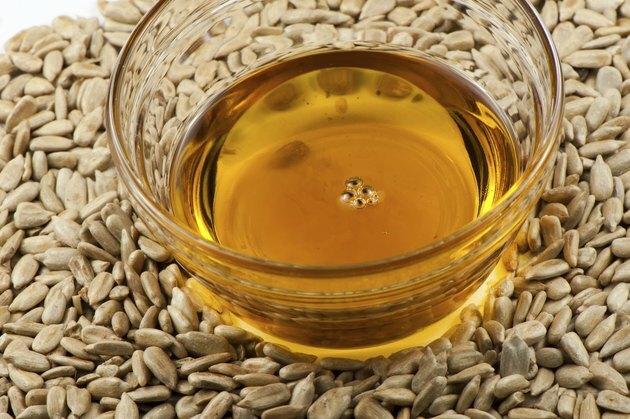 Most of the fat in sunflower oil is unsaturated, and this oil is a nutrient-dense food, according to the 2010 Dietary Guidelines from the U.S. Department of Health and Human Services. In moderation, sunflower oil may provide certain health benefits as part of an overall balanced diet. Each 1 tablespoon serving of sunflower oil has 8.9 grams of linoleic acid, which is an omega-six polyunsaturated fatty acid that is an essential part of a healthy diet, according to the Linus Pauling Institute. You need at least 11 to 14 grams per day, but most people get too many omega-six fatty acids compared to an even healthier category of fatty acids called the omega-threes. The University of Michigan suggests lowering your intake of corn, cottonseed, soybean, safflower and sunflower oils in order to improve your ratio. Omega-three fatty acids are found in seafood, flaxseeds, walnuts and canola oil. Sunflower oil provides 124 calories and 14 grams of fat per 1 tablespoons serving. About two-thirds of Americans are overweight or obese, and obesity increases your risk for chronic diseases such as heart disease and diabetes. However, a moderate amount of fat in your diet -- such as 20 to 35 percent of your calories from fat, or 44 to 78 grams fat per day on a 2,000-calorie diet -- can help you maintain a healthy weight while getting the nutrients you need, according to the 2010 Dietary Guidelines from the U.S. Department of Health and Human Services. In moderation, sunflower oil is a healthy fat that can help you achieve this range. A benefit of sunflower oil is that each 1 tbsp. serving provides 5.6 milligrams of alpha-tocopherol, a form of vitamin E that acts as an antioxidant in your body, according to the Linus Pauling Institute. Sunflower oil has more vitamin E than other good sources, such as most nuts, peanuts and olive, soybean, corn and canola oil. Consuming a good amount of vitamin E may strengthen your immune system and lower your risk for heart disease. Sunflower oil is low in saturated fatty acids, which are unhealthy because they raise your cholesterol levels. It is cholesterol-free and sodium-free, and it makes a healthy substitute for salted butter, which is high in saturated fat, cholesterol and sodium. Sunflower oil is also naturally free from trans fats, but it can contain trans fats if you eat processed, partially hydrogenated oil as an ingredient in packaged foods, such as snack crackers or cakes. Is Canola Oil More Healthy Than Olive Oil?